Interlocking modular chassis design keeps the motor and the gear drive together as a unit to virtually eliminate gear-crunching chassis flex. Plus, the design provides easy access to critical components, making any needed maintenance or repairs a snap to perform. The wheels and tires are massive and so is the grip from the burley, super aggressive all-terrain tread. Add some modern style in the wheel and back it up with power for a combo that roosts dirt and gravel like a 450 dirt bike! 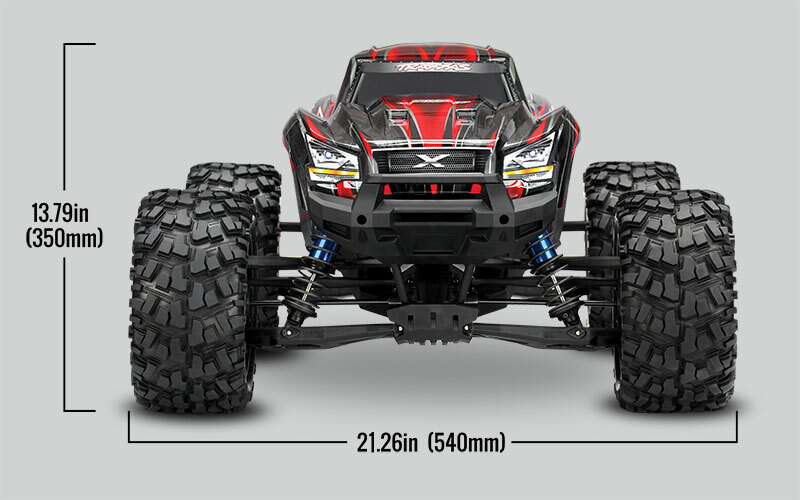 X-Maxx’s long-travel, super-plush feel is assured with four enormous high-performance oil-filled GTX™ aluminum shocks. The large oil volume dissipates heat for all-day shredding while an integrated wiper seal keeps the shafts clean, reducing seal wear for long life. 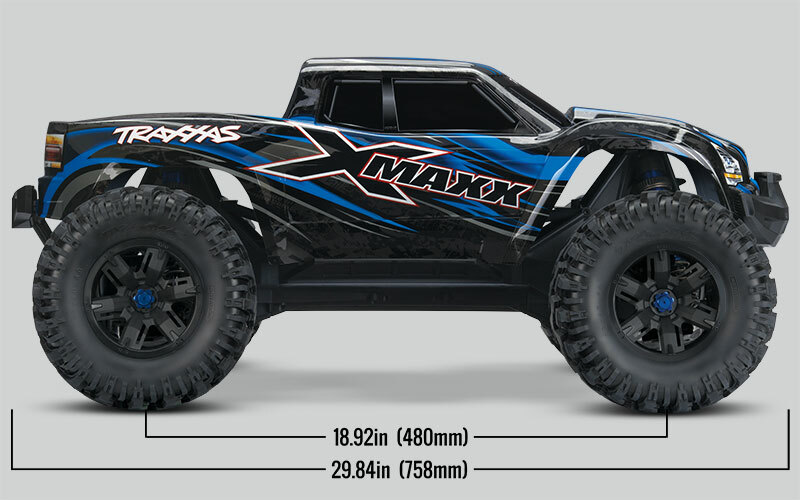 X-Maxx’s shock towers introduce an exclusive new Traxxas look that offers rigid, triangulated structure and an authentic off-road look that fills in the wheel openings of the truck. They also serve as a convenient carry handles and provide level supports for the X-Maxx when placed upside down for cleaning. The all-new motor mount design cradles the motor so it can’t flex on the mount. Gear mesh is held firmly in place by keyed pins so there’s no need for tricky adjustments. 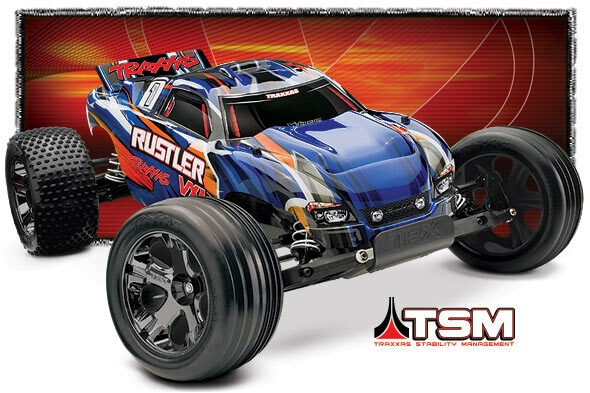 Achieving X-Maxx’s huge suspension travel, tight turning circle, and incredible strength required hundreds of hours of modeling, development, and testing to package all of that capability in these sophisticated components. Exciting visual form follows unsurpassed function and performance. 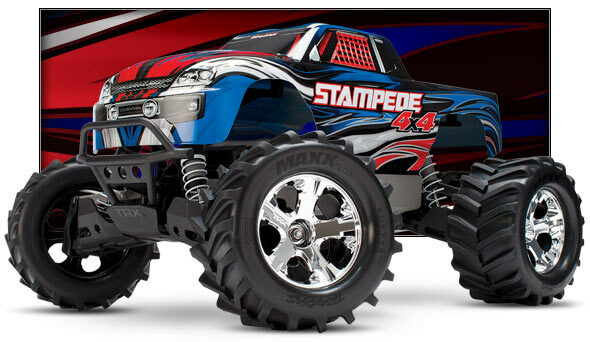 Waterproofing our models has never been an afterthought at Traxxas. 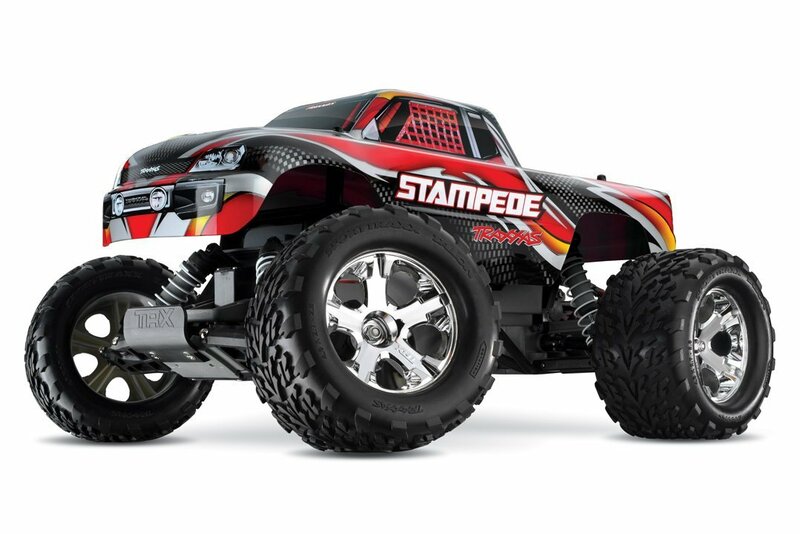 Patented Traxxas innovation seals out the water so that your playground doesn’t end when the fun involves water, snow, and mud. Dirty truck? Just hose it off. The new style box allows fast radio access without removal. 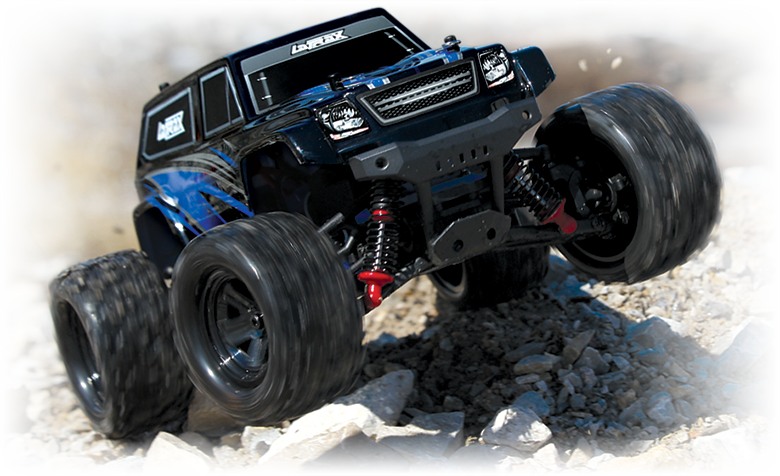 A new servo was created to deliver the strength and the torque necessary to give X-Maxx unmatched steering authority. The quick steering and tight turning circle, combined with advanced suspension geometry, gives X-Maxx nimbleness and control that is unexpected in such a large vehicle. X-Maxx is equipped with new energy-absorbing impact cushions behind the front and rear bumpers to help soften the blows and make X-Maxx even more durable in demanding situations–even the unexpected ones. High-strength steel driveshafts were engineered to maximize suspension travel, steering angles, and overall durability. The differential outputs are splined for incredible strength, and they center bolt to the differential for easy cleaning and service. Splined wheel hexes eliminate axle pins that require through holes that create a weak point in shafts. Traxxas’ unique slipper clutch design features a dual-fan arrangement for enhanced cooling. The slipper clutch absorbs shock loads on the driveline and gives X-Maxx the strength to blast full throttle across the most challenging and rugged terrain. The tough aluminum center driveshaft carries the power to the front and rear differentials. Splined drives are used throughout for precise engagement, incredible strength, and smooth running. X-Maxx differentials are all steel to handle the rigors of challenging off-road situations. The differentials are sealed and filled with heavyweight oil, which gives the feel of limited-slip differentials. What the driver feels is confidence as the X-Maxx power slides through turns with massive roost and total control. X-Maxx is equipped with full contact sealed bearings in outboard locations to keep out the grime and grit. Less downtime for cleaning and maintaining bearings equals more up time for X-Maxx…up in the air that is, as you power over your favorite jumps.